Despicable Her: Jefferson Memorial Homes allows CEO 58% raise despite huge debt, missed payroll taxes, and a negative net worth. 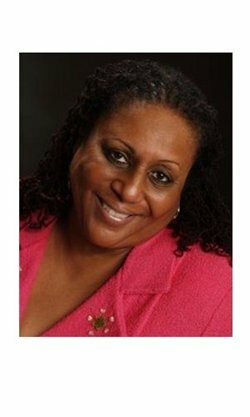 Dr. Cecilla Jefferson, the founder and executive director of Fred Jefferson Memorial Home for Boys, received almost a 58% pay raise from the years 2009 to 2010. The inordinate pay raise took place despite large operating losses, huge tax liabilities and negative net assets. The most recent county audit suggests the agency may not have a way to pay back their debts. 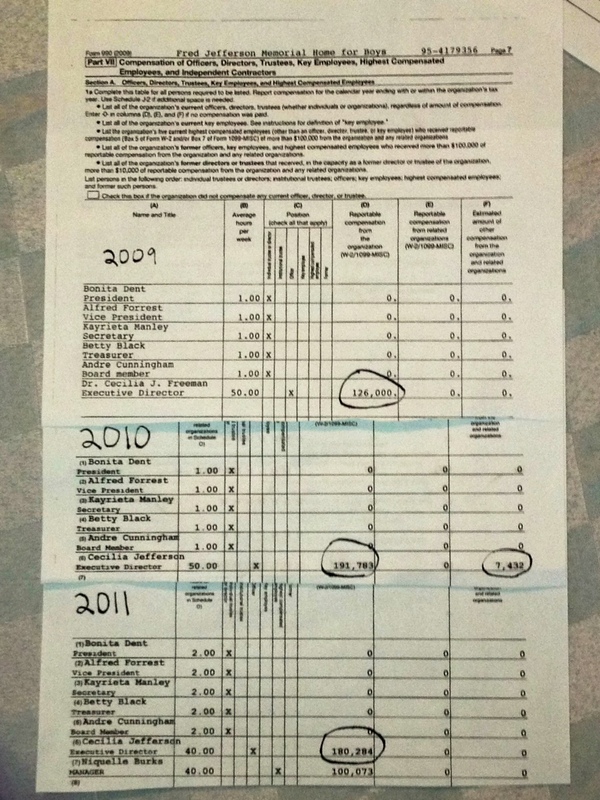 The executive directors salary increased from $126,000 to $199,215 in 2010. An increase of over 58%. Cecilia Jefferson’s salary in 2011, is listed as $180,284. Yet, during this time period, Jefferson Homes had operating losses amounting to $240,000 and $84,359 respectively. More concerning, Jefferson Memorial Homes had $630,997 in delinquent taxes, penalties and interest, from unpaid payroll taxes in 2006, and 2010. For good measure, county auditors also documented $48K in unallowable expenses, and negative net assets amounting to $582,971. 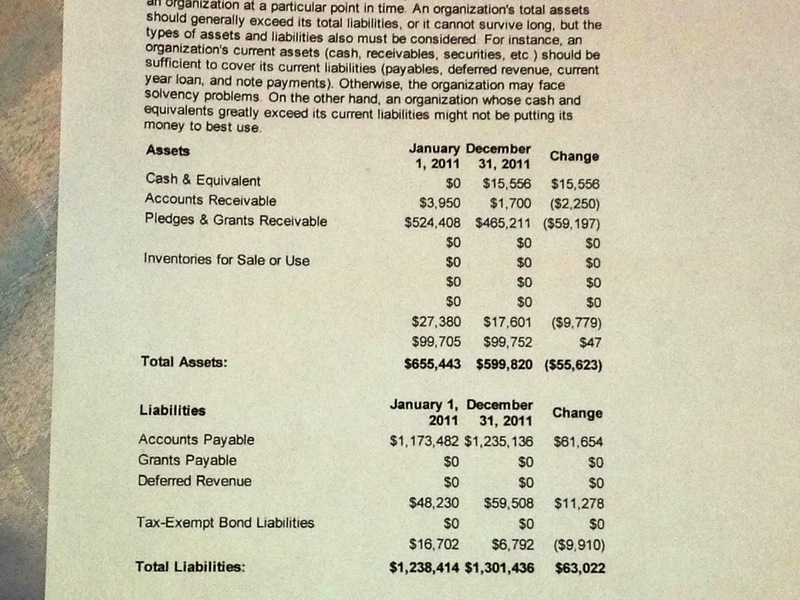 A copy of the 2009 (990) tax filing, can be seen here. The 2010 tax filing is here. (Pg. 7 for salaries), And the auditors review of Jefferson’s fiscal operations dated March 13, 2013 is here. On her linkedin page, Dr. Jefferson lists herself as the owner and CEO of Fred Jefferson Memorial Homes since 1989, and she has a PhD. In Social Clinical Psychology. The question is this. How long can Jefferson Memorial Homes continue operating, when total liabilities are almost double its net assets? And why did board members, as well as the executive director, acquiesce to such a large pay raise? Especially when this non-profit is managed so incompetently? A large pay raise, totaling almost 60% from one year to the next. Isn’t that the last thing one should expect, after mismanaging a place into the ground? But does anyone find this a bit obscene? Don’t places usually cut back, when liabilities are so large? Doesn’t any business or non-profit cut back, when their ability to survive is seriously in doubt, as documented by the county audit? And from this, they want a fundraiser? It is like a sinking ship, with everyone trying to get as much gold and treasure to dry land, before the agency…err boat, plunges down to certain death. When the county makes temptation this easy, when the bar is so low, shouldn’t we still expect more from our ethical leaders? Even if it is not illegal? You can’t make this stuff up. This is money for abused and neglected children. It adds up to quite a bit. And since when can you owe the IRS big time money like this, and still give yourself almost a 60% raise? What’s the rationale? It’s my turn now? Watch the, oh so moving, fundraising presentation, by the ‘model,’ foster-teen, who is brought on stage to elicit a few tears, as she extols the spiritual aspects of charitable giving. We have all seen it. Left unsaid at this fundraiser, the extra $193,000 paid over just 3 years, which went to the boss, (instead of the abused and neglected children), in the form of a raise. That is, unless, you want to donate the extra half-million plus you may have gathering dust somewhere, in the back of your sock drawer? Should you want to contribute, you may donate here, or here. So please, oh please, do it for the children. They are so desperately in need of our help. Because it’s all about the children.